Have you ever come across someone who captures a style that you can admire but never hope to emulate? Elton John made me awestruck when I found a copy of Greatest Hits in my sister Karen’s room when I was a kid. The album came out at a time when greatest hits packages actually meant something, long before digital made it possible for listeners to create their own playlists. The best collections served as an introduction to an artist’s body of work and made it easy for you to enjoy in one listening singles that you otherwise had to catch on the radio if you were lucky enough to be listening at the right time. 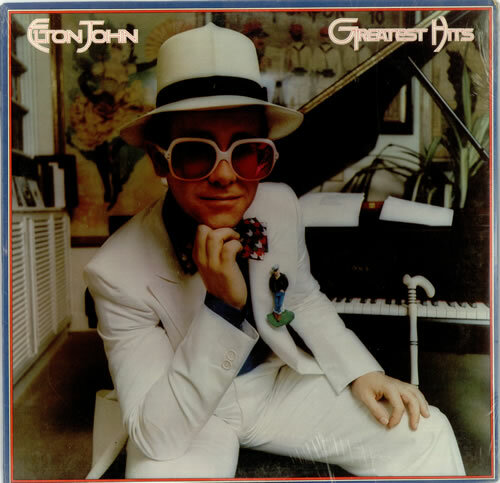 And Elton John’s first Greatest Hits collection was one of the best, not only for the music but the memorable album cover. All the songs that defined his rise to superstardom were laid out for you like diamonds — hits like “Rocket Man,” “Your Song,” and “Bennie and the Jets” (I always wondered who came up with the brilliant idea of pronouncing “Jets” like “jetssssss,” which gave the song its signature moment). My favorite was (and remains) “Daniel.” When he sang “Daniel, my brother, you are older than me/Do you still feel the pain” my mind drifted to my brother Daniel, who was two years older than me and who was indeed experiencing a lot of pain in his life. I’d heard all those songs — how could you not growing up in the 1970s? — usually riding in the car with my mom and dad, driving to places like Peoria, Illinois, or Mishawaka, Indiana, to visit relatives on both sides of the family. Even on a crappy car radio, his songs were unmistakable. But when I found that album, I didn’t even bother listening to the music at first. I really didn’t need to. I just studied the album. Every detail. The creamy white suit, oversized glasses, and natty hat offset by the dark blue shirt and multi-colored bow tie. The over-sized pin of the dude looking like Marlon Brando in The Wild One affixed to his jacket. And to top it all off, that elegant walking stick. On the back cover, there he was, playing his piano, wearing glitter shoes. I loved everything about his look, but I realized he had captured a style that was all his own. I was just a kid entering adolescence, with no sense of how to look. I was making that awkward transition from matching clothes to jeans and shirts, but I had no idea what I was doing, and I was too shy and awkward to try to attempt to look anything like presentable. On that album cover, Elton John gave me a glimpse of another world, of other possibilities beyond my imagination. All I could do was press my nose against the glass and watch. This entry was posted in Music and tagged albums, David Deal, Elton John, Greatest Hits, Superhype, vinyl. Bookmark the permalink.